September 14 - NO PARAPROFESSIONAL TRAINING! Moved to April 11th! Librarian, Information Scientist, Media Specialist, Oh My! North High Technology teacher and board member of the Computer Science Teachers Association (CSTA) local chapter, Mr.. Derek Babb, invites all OPS librarians and computer teachers to attend the CSTA's September 10 meeting. This meeting is focused on bringing CS into media centers and libraries. They are going to have Heidi Blackburn from UNO speak and breakout session on adding Maker Spaces and other CS content to libraries. See attached the flier with RSVP info. That's right!!! Eric Litwin is coming! Author Eric Litwin is coming to Omaha Public Schools February 25-March 1. We are expecting this will be a very popular presentation and, with only 10 slots, we want to ensure that Mr. Eric's time in Omaha is well spent. Details for applying to host Mr. Eric are in the attachment below. Applications are due by September 20! FYI: Anyone can attend the live webinars for free. Only AASL members can watch the archived recordings. 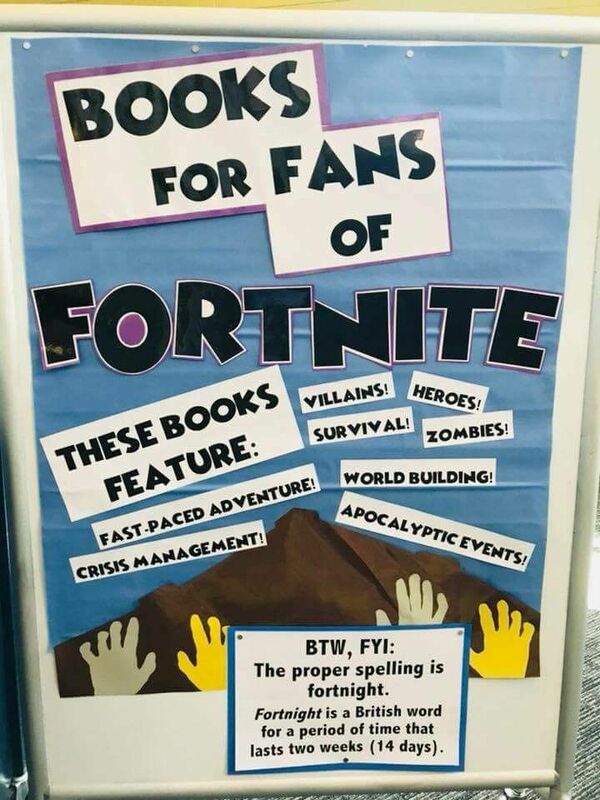 Not quite sure what Fortnite is? Ask your students. Most age levels know about this popular game. This might be a fun display to have students and staff help you with prior to open house or conferences. 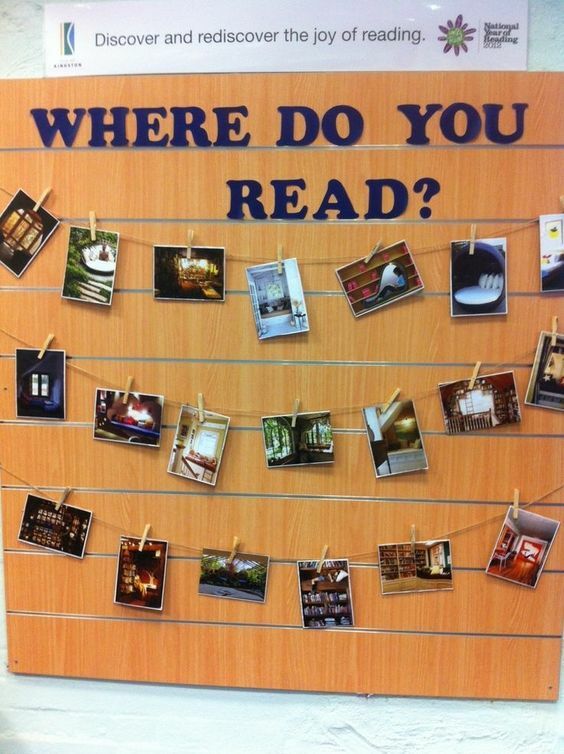 They could send in photos of themselves reading at home or other places to add to your display! Then, on o.h. or conference night, they could stop by with their parents to see themselves as part of the display. Attached below is a handout on Sora that can be given to students, staff and families. When you first open Sora, select any OPS school. It does not matter which OPS school as the content is purchased at a district level. You will then need to sign into your account. Currently the URL associated with the OverDrive graphic on your library database DNN page is set to go to the old OverDrive site (except if you are at a secondary school). The reason for not switching to the Sora URL is that you cannot use the easy login with Sora. The easy login allows parents/guardians to access OPS OverDrive materials without knowing their student’s ID number. The easy login will be available in Sora in the summer of 2019. So for this year, you will have a link for Sora (coming soon) showing up in the links on the left side of your library database DNN page. You will also have a link for OverDrive Quickstart (elementary only) in your links. Just a reminder, the OverDrive Quickstart is completely separate from the OverDrive content purchased at the district level. Ouickstart is the 200 simultaneous access titles provided to us by OverDrive. If you have questions, let me know. If you have suggestions for content for me to purchase in OverDrive, send me an email. With budgets opening soon, now is the time to identify books moved to lost status over the summer that you might want to replace. In LS2 Reports, you can search for a report called Items with Status by Holdings Codes (paste the name of the report in the search box in reports). When the report has finished running, open the report in Excel by pulling down the drop down menu in the right corner of the paper with HTML on it. Once you have the report open in Excel, you can sort the report by Status Date. The Status Date is the date that the item moved from long overdue to lost. Now you have a list of items that were marked lost during the spring and the summer that have not been returned to your library as of yet. If some of the titles are extremely popular, you might consider putting them on your first list of purchases for the 2018-2019 school year. Let me know if you have questions, thanks. Hosted by Facebook, Digital Literacy Library provides learning resources made available under a Creative Commons license by Youth and Media at the Berkman Klein Center for Internet & Society at Harvard University. The lesson modules are designed to help young people develop skills needed to navigate the digital world, critically consume information, and responsibly produce and share content. The interactive lessons involve group discussions, activities, quizzes, and games that have been built in consultation with teens. 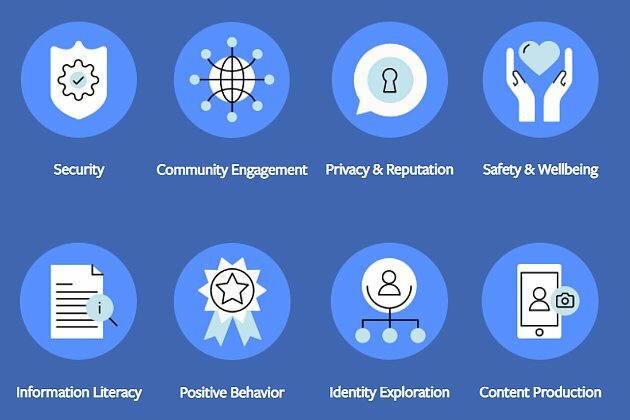 The lesson modules are organized around the topics Privacy and Reputation, Identity Exploration, Positive Behavior, Security, and Community Engagement. They can be used either collectively or individually in the classroom, as part of afterschool programs, or at home. Boston Children’s Museum has been creating curriculum, activities, and other resources for educators and parents for more than 100 years. These resources are rooted in decades of understanding how children learn most effectively and how adults can best support that learning. The museum’s resources include the multiple-award-winning Beyond the Chalkboard website, which is used by tens of thousands of afterschool professionals all around the world; the STEM Sprouts Teaching Guide, which offers ideas and activities for early childhood educators who teach science, technology, engineering, and math; guides for afterschool educators working with English language learners and children with autism; and BCM Home Edition, a book of 26 activities that families can try together at home. 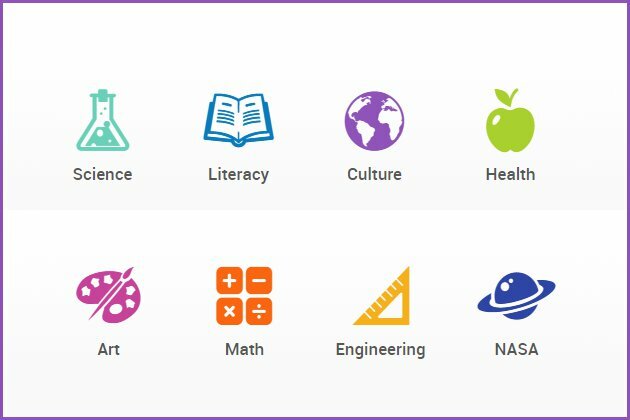 Each of these resources is available for free to any parent, teacher, or other caregiver who wishes to use them. Below are some interesting articles from October 2017's Teacher Librarian. Check back each week for more articles from school library related publications to read when you have time. No login names or passwords needed inside the OPS network. Based on this study's findings, teacher librarians are advised to allow lower elementary students to check out the same number of books as allowed to upper elementary students. In addition it is recommended that librarians provide the option of exchanging books in between scheduled class library visits. Both practices support reading promotion. The article discusses the trends in school library programs and offers an overview of the initiative of American Association of School Libraries (AASL) president Audrey Church and its role in promoting discussions between school librarians, administrators and stakeholders. Topics include how school librarians can transform learning, advocacy for change, and the role of school librarians as learning leaders. The article focuses on the aspects of how teacher librarians are utilizing technology to improve quality education and learning outcomes. Topics discussed include the advocacy on programming and innovation through partnership, social media, and digital footprints, the significant of technology company Microsoft in supporting and empowering educator through its education programs, and the advantages of the memberships on professional learning networks. The article focuses on the roles of school librarians and principals in positioning school library programs (SLP) to benefit more students. Topics discussed include the strategies to influence principals which involve knowing their concerns and objectives and changing the conversation to establish collaboration and engagement, the aspects of developing and implementing plan to influence, and roles of librarians to influence key decision makers who hold power over SLP. 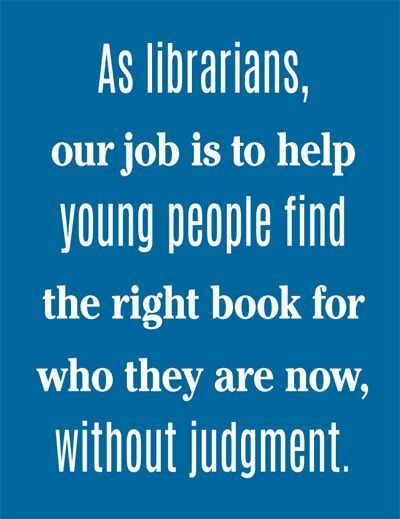 School Librarians Transform Learning: Advocacy Begins with You!